OIKODOMOS (www.oikodomos.org) is a pedagogic research project financed by the Lifelong Learning programme carried out by higher education institutions and research centers from Belgium, France, Slovakia, Spain, Switzerland, the United Kingdom and North Cyprus. The goal of OIKODOMOS -a Greek word for "the builder of a house"-, is to create a virtual campus to support and promote housing studies at a European scale. The pedagogic model which supports these activities is based on the collaborative design and implementation of sequences of learning activities. The blended learning approach adopted in OIKODOMOS combines learning activities carried out in virtual environments specifically developed for the project with seminars and design studios taking place at the participating universities. to consolidate the virtual campus methodology and technological platform. to expand the application of the pedagogic methodology to other institutions. to disseminate the results among the academic and research communities, as well as among local communities. It is a network of learners (teachers, students, adult learners) and activities, as opposed to an organization of schools with shared curriculum. It is interdisciplinary, since the learning activities conducted by the networks encompass architecture as well as urban planning. It goes beyond academia, since it seeks for the engagement of citizens and professionals in the field of housing studies. The Oikodomos technological platform provides the medium which makes the application of the collaborative pedagogic model viable. 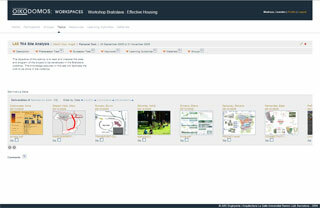 It consists of two environments: Workspaces and Case Repository. This is a digital repository of housing case studies, which was and is constructed collaboratively by learners. Currently, it has over 330 documented cases, analyzed and commented by students and teachers from different institutions. It is used to support learning based on the analysis of precedents. 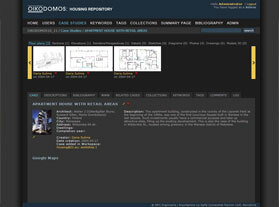 Engaging in discussions regarding contemporary housing issues in the Oikodomos blog. This can done by posting a topic for discussion, commenting the posts from other participants. Proposing a learning activity which will be shared by other partners. In this case you and also your students will need to register in Oikodomos Workspaces. Using the Oikodomos Case repository as a learning resource to add new projects, and to analyze and comment existing ones. Participating in joint workshops taking place during one week at participant institutions. Prior to the workshops there are a series of learning activities which are carried out distantly using Oikodomos Workspacses.